The State Normal School at Jersey City » James Betelle, Where Are You? Guilbert & Betelle designed a number of normal schools (later called teacher’s colleges). The earliest, Newark Normal School built 1913, is a handsome Jacobean design in the Forest Hills neighborhood of Newark. 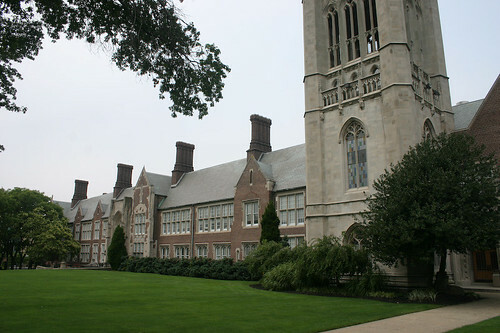 Two others, built in the mid 1920s, were Glassboro Normal School (today Rowan University) and New Britain Normal School (Central Connecticut State University). The last such school built by the firm was the State Normal School at Jersey City. It is handsomely rendered in Betelle’s trademark Collegiate Gothic, and is certainly among his finest works. Today the building is named Hepburn Hall, and serves as the administrative building for New Jersey City University. The State Normal School (SNS) has an L-shaped plan, comprised of a classroom wing and perpendicularly auditorium (similar to the Newark Normal school in reverse). Construction began in October, 1927, the classroom wing opening for students in September, 1929. 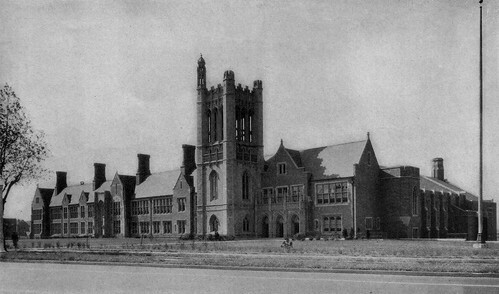 The tower and auditorium wing was finished later, and the completed school was dedicated on June 6, 1930. In all, it cost about $1,500,000. Surrounded by an iron fence, the SNS is set back from the road, fronted by lush lawn, an oasis of academia in a dense urban downtown. The exterior is wrapped in red brick in English bond with limestone trim. The most striking feature of the building is certainly the bell tower, Betelle’s design recalling that of a traditional English church (left: St. Luke’s Church in Brislington, England). 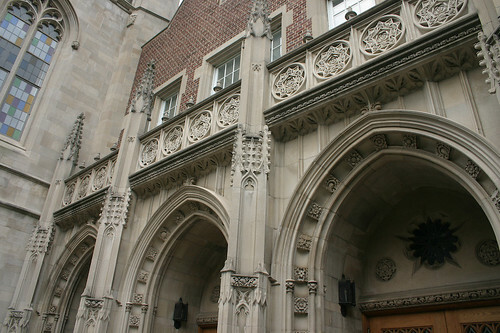 Faced in randomized limestone blocks and set with detailed Gothic tracery and finials, it serves as a visual anchor for the entire building. The bottom two floors of the tower is interior space for the school. The actual tower rises above the second floor, and is purely decorative, save for the tolling of the bell (now a recording). One detail that caught my eye are the animals surrounding the top of the second floor. The school is dotted with whimsical corbel heads, but these are uniquely Art Deco-ish in style. The SNS has but two minor exterior alterations; a small office addition in the rear of the building, and a triangular glass enclosure housing an elevator at the far end. Most of the windows were replaced in recent years, but care was taken for them to retain the look of the originals. Some do still have original leaded panes behind modern glass. These changes have barely impacted the appearance of the school. Auditorium entrance. Three Gothic arches are deeply set in a porched facade, decorated with theatrical imagery. Leaded glass in rosettes and the original Oak doors admit moody light into the foyer. The school’s main entrance is set within a limestone facade similar to the tower, and paired with a large projecting gable surfaced with Tudor-style random stone quoining. The original name over the doors is gone, but the letters “SNS” in carved panels between the first and second floor windows remain. The interior of the building has been mostly modernized with drop ceilings and partitions, but a few rooms have been well preserved, primarily the handsome auditorium and lobby. The lobby’s tile floor is bordered by whimsical terra-cotta tiles depicting various animals and cultural glyphs (possibly done by tile craftsman Herman Mueller, also responsible for the lobby tile-work at Columbia High School). Centered on the back wall is a dedication plaque, optimistically dated 1928. 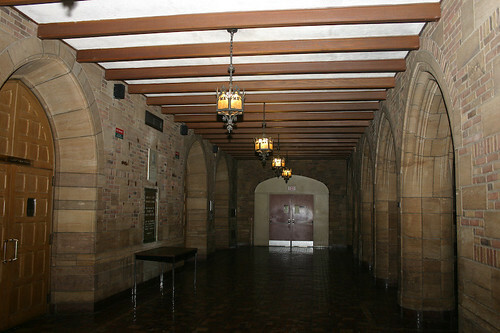 The auditorium lobby is amber-lit stone enclave, with an arcade of Gothic arches lit only by original lanterns and natural light from the doors. The auditorium itself was rehabilitated about 15 years ago, including plaster restoration and application of original hand-painting designs on the ceiling. On my visit it was very dark, so unfortunately I didn’t get very good photos, but it appears to be in very good condition. Other interior spaces of note include the school’s former library, now called The Gothic Room. It’s a large space facing the rear of the school, with tall stained glass windows, wainscoting and a fireplace. On the second floor of the tower is a tall, bright art gallery, also with stained glass gothic windows and Tudor ceiling. It was originally the school’s music room. The SNS, about 1931. The basement level contained the demonstration kindergarten, with a separate entrance for the children. Today it is used as a daycare center. 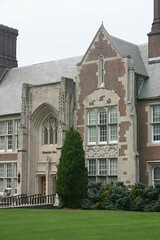 The State Normal School at Jersey City was one of the last Collegiate Gothic design of Guilbert & Betelle’s completed. By the 1930s the European “modernistic” style, which eschewed the overtly historical trapping of Gothic for a more minimal “honest” aesthetic, was in vogue. Today, however, Collegiate Gothic is enjoying a fresh appreciation and rebirth. The stewards of the SNS have wisely kept the exterior and major interior spaces mostly intact, and now as Hepburn Hall, is a fitting point of pride for the school and community—as it was 80 years ago. The auditorium (Margaret Williams Theatre) was renovated in 1998. The oak doors at the auditorium entrance are not the original but faithful replicas installed during the 1998 renovation.